The Spectre 9983 fits some Chevrolet Impala SS models. See vehicle applications for details. Spectre air intake systems are designed to get more horsepower and torque from your vehicle while working to protect your engine from harmful debris. 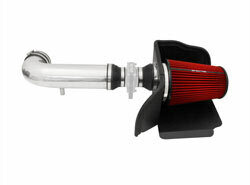 This air intake comes with a red Spectre reusable low restriction air filter, high quality polished aluminum tubing and a black powder coated heat shield to help prevent engine air from entering the intake inlet. Spectre air intakes come with the necessary boots, clamps and hardware for an OE fit and finish. Noticeable difference in speed and torque after installing this. Only thing it was missing was the cuplink from 3-2.5 inches to fit the filter. Other than that. Great product. Solid system, looks good, simple straightforward instructions and it performs beautifully. I would highly recommend the system.